We’d love your help. 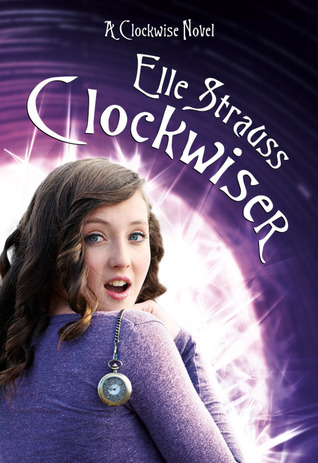 Let us know what’s wrong with this preview of Clockwiser by Elle Strauss. The last year has been smooth sailing for Casey Donovan. She and her boyfriend Nate are doing better than ever, and things at home are good, too. Everything’s been so calm, she hasn’t “tripped” back to the nineteenth century in ages. Then the unthinkable happens and she accidentally takes her rebellious brother Tim back in time. It’s 1862 with the Civil War brewing, and for The last year has been smooth sailing for Casey Donovan. She and her boyfriend Nate are doing better than ever, and things at home are good, too. Everything’s been so calm, she hasn’t “tripped” back to the nineteenth century in ages. Then the unthinkable happens and she accidentally takes her rebellious brother Tim back in time. It’s 1862 with the Civil War brewing, and for Tim this spells adventure and excitement. Finding himself stuck in the past, he enlists in the Union army, but it doesn’t take long before he discovers real life war is no fun and games. Casey and Nate race against the clock to find Tim, but the strain wears on their relationship. It doesn’t help that the intriguing new boy next door has his sights on Casey, and isn’t shy to let her know it. To ask other readers questions about Clockwiser, please sign up. Clockwiser, the second book in the Clockwise series turned out as whimsical, delightful, and a fun read as the first book, Clockwise. I enjoyed it as much as I did the last book. The writing is brisk and strong, consistently vivacious. It reads pretty quickly, but the pacing is just right. There was nothing unnatural as far as I'm concerned. The new additions to the cast of characters lends the book some complexity and layers, making it even more entertaining and even emotional. It was really en Clockwiser, the second book in the Clockwise series turned out as whimsical, delightful, and a fun read as the first book, Clockwise. I enjoyed it as much as I did the last book. The new additions to the cast of characters lends the book some complexity and layers, making it even more entertaining and even emotional. It was really entertaining and intriguing when Casey "accidentally" brings Tim, her younger brother, to the past and Willie, the eldest son of the Watson's, back to the present from 1881. For Willie, who was suddenly yanked to the modern 21st Century, it is literally an "encounter with the future," his bewilderment and discomfiture was so fun and I think it was well-portrayed. Tim's rebellious nature also adds a lot of fun to the book. Enlistment in the army is the last thing Casey ever imagined! Oh, my. It was interesting that we get to delve a bit into the history of Civil War and the situations surrounding the war at that time. Although my overall impression toward this book is as agreeable as the last one, I had some tiny niggles with this book. I liked the main character, Casey for her perkiness and sassiness, not being bashful even in front of her crush and who later becomes her boyfriend, Nate. When she (again, accidentally) yanks Nate back to the past, the momentary discomfiture was evident, yet she quickly recovers and displays her survival skills by hunting right in front of Nate's eyes. Yet in this book, that side of her, which I really adored, kind of took the backseat to what seems a bit forced romantic complication. She seemed to be reduced down to a typical teenage girl who constantly fusses over her boyfriend, completely losing the shine that she had in the last book. I felt the romantic twist with Miller was a bit forced and contrived, felt like it was added just to make Nate jealousy and instigate fights between perfectly happy Casey and Nate, it worked just all right, it had me positively frustrated and irritated, the exact effect what I think the author must have aimed for. That said, once again, the whole "romantic complication" was a bit too much for me, this book could have been totally entertaining without the addition of Miller. Besides, Casey is dating Nate... what’s the butterfly she has in her stomach when Miller puts a moves on her? Oh, no lol How he ends up was also such a fizzling out. I was totally a happy-camper without the Miller stuff. Period. I also found several plot holes in this book; first, the Willie thing. Granted, it's nearly impossible that we get to know how Willie ends up after going back to the past, but I could use some after-story which just to insinuate whether the butterfly effect is still at work and everything went back into the same track or the past was altered in some way because of what's happened to him. We don't even know if Willie made it in time to save the past! I could use some descriptions about that at least. Secondly, Tim; likewise the Willie thing, the descriptions felt a bit scarce about whether there's a change in his demeanor or not after he safely comes back to the present. I'll try not to give away the plot, but what he confronted during the Civil war actually makes him regret for his own rebellious behaviors to his family. New appreciation has come to him - then why there's so little description on that? I would have wanted more. It might be only me though. Overall, I did enjoy this book as much as I did Clockwise, but felt slightly lacking. Or, have I become more critical than I was 2 years ago? Either way, there's no denying this is a fast-read, glorious YA with some fun time travels. I gave the benefit of the doubt when I was grading the first book – Clockwise. However, now I can say that Clockwiser fully deserves its five. The plot continues. Casey and Nate are still a couple, although Nate has already been in college and Casey is a bit worried that he might find a new girlfriend there. Also, some extra problems between those two add colour to the novel. There are all other people to whom we are used to, especially Lucinda and the Watsons, and there is this cute new guy: Cha I gave the benefit of the doubt when I was grading the first book – Clockwise. However, now I can say that Clockwiser fully deserves its five. The plot continues. Casey and Nate are still a couple, although Nate has already been in college and Casey is a bit worried that he might find a new girlfriend there. Also, some extra problems between those two add colour to the novel. There are all other people to whom we are used to, especially Lucinda and the Watsons, and there is this cute new guy: Chase. Tim got his own part of the story and the next part evolves around Willie. Casey is stuck in between them, and she’s trying to make both ends meet. Not everything ends that well but the story is gripping. What I like most about it, is quick pace, the focus on action instead dull descriptions, as well as an original idea. The author proved to be a brilliant and quick learner and the technique of writing is noticeably improved. Although I didn’t mind the way the romance was evolving in Clockwise (nothing like one of those pretentious love stories), the method of leading the story could have been improved. Clockwiser, on the other hand, is more reliable in setting up the story. I found attractive the way memory works in the book, how the main characters recall events from the past, how they try to go into the future. I also found one idea quite inspirational and this is where we perversely move to some drawbacks of the novel. Playing around with time and the investigation into the possibility of cheating the timeline was a great idea and quite well led. However, I think it was not exhausted in a way that it could have been. I also didn't find very convincing the explanation of why it had to be that way – but it led me to my own interesting conclusions. Also, the author still has some minor problems when connecting some ideas from different parts of the book. It might be thinking alike but I knew where the story was going once I read a hint about some irrelevant signs (or at least it was meant to be shown as that), and I think the conception was to surprise the reader with an unexpected twist of events – which just didn’t work for me. Those are just minor problems and they don’t stop you from enjoying the story. I was reading till the very late hours at night, just couldn't put the book down. If you found the first novel amusing, you can pick up this one and you won't regret your decision. Clockwiser is the second book in the Clockwise series. It’s clean and suitable for tweens and teens looking for a quick read. It’s refreshing how quick paced this series is, focusing on the action of it all instead of endless details that I have to skip. Chase Miller, I feel he’s an unnecessary character who came into this story with no purpose whatsoever. Casey even considering this guy. Still, I enjoyed the whole story! A couple months ago I was lucky enough to be able to read Clockwise by Elle Strauss as part of a virtual book tour. Not long after Elle Strauss emailed me to see if I'd also like to read and review the sequel. I immediately responded YES and so was able to also read Clockwiser. With everything going on it has taken me a bit longer to write this review. Clockwiser continues the story of Casey Donovan and her friends and family around her. Casey is different that other girls her age because she time travels. I've read other books on time travel and I just love how elegant time travel in her books are. In other books it can be confusing and mind boggling to keep straight when the main character time travels. But in Elle Strauss's series it is always obvious and easy to follow. Casey hasn't "tripped" (her word for time travel) since the last book left off which is the longest she has gone without tripping. But then when she is having a disagreement with her younger brother TIm, she touches him and suddenly travels back in time with Tim. When Casey trips, if she is touching sometime skin to skin (ie holding hands) she brings them back with her!. Casey only travels back to the same time and so as she has gotten older so have the people she has befriended in the past. Tim has no idea that Casey has this amazing 'talent'. At least he doesn't until he ends up tripping back in time with Casey. A huge problem this time is that it is now 1862 in the past and the Civil Was is quickly approaching. While Casey is safe from being drafted because she is a girl, Tim (while a little under the age requirement) isn't necessarily exempt. Since Casey must have skin to skin contact when she trips back to the present she tries to make sure Tim is near her at all times. But when she returns to the present without Tim panic sets in. Now Casey and boyfriend Nate (who went back with her in the first book) keep trying to return to the past to get Tim back, but Tim being impatient and rebellious decides to join up with the Union army. I really LOVED every page of Clockwiser. I read through it in one sitting! This is by far one of the best novels I've read since I started blogging a year ago! I had so much fun reading both of the books in this series and cannot wait to read the third Like Clockwork. I love the way Elle Strauss is able weave together the past and present in such an easy to follow and beautiful way. I really don't have anything negative to add except that I wanted both books to be longer. I think that the premise for how Casey time travels is just fascinating as it can happen at any time day or night. No matter how much time Casey spends in the past she always returns to exactly where she left off. If you like YA books on time traveling then you really should pick up a copy of Clockwise and Clockwiser. I'm using the term 'better' very loosely here when I say Clockwiser is better than Clockwise. The plot setup's not as ridiculous as before, if still ridiculous, the time traveling gets a (little) bit more fleshed out, the writing doesn't feel like the wrong kind of juvenile as it did before at times, and there's much more of Willie and Lucinda. I almost feel bad for knocking off a star, but... It's just so cheesy. Clockwise started all sorts of wrong for me, but I liked that it could be serious w I'm using the term 'better' very loosely here when I say Clockwiser is better than Clockwise. The plot setup's not as ridiculous as before, if still ridiculous, the time traveling gets a (little) bit more fleshed out, the writing doesn't feel like the wrong kind of juvenile as it did before at times, and there's much more of Willie and Lucinda. I almost feel bad for knocking off a star, but... It's just so cheesy. Clockwise started all sorts of wrong for me, but I liked that it could be serious when the plot needed to be serious. I couldn't take anything in this book seriously. Everything was just so cheesy. Yeah, repeating myself, but it really is this cheesy. Most of it probably has to be due to the fact that, this time around, Casey's not really the star of the show. She and Nate seem to be more along for the ride in this one, and the other characters actually driving the plot are just so ridiculous (plus, I didn't really see the point of the Chase Miller character at all, he's only there for unnecessary manufactured drama, and the resolution of that plotline was just weird). So Tim, who starts the whole thing by surviving a near death experience, is just completely absurd, what with his complete lack of common sense and joining the Union Army during the Civil War. And if there was any chance I'd accept any of that as him just being stupid ... he and Josephine completely negated that. Then Willie ends up the wide-eyed visitor from the past that Lucinda immediately latches on to, sorry, I couldn't follow the plot with a straight face at all. Despite my criticisms, Clockwiser isn't bad in the sense that Clockwise was 'bad', it's better, if you're looking for light cheese. Good light cheese, in fact. It's just not something that really hooked me, unfortunately. I couldn't take the Civil War, Bull Run, storyline seriously as it should be taken seriously, not with Casey train hopping and Willie's predictably fish out of water reaction to the future completely distracting me. It’s been a year since we last saw Casey and her boyfriend, Nate. Things are just heavenly for the couple and she hasn’t even tripped the whole time. Yep, life is good! Well it is until Casey’s mom finds pot in her brother Tim’s possession. While Casey is trying to question Tim about the pot, the stress comes on and they are tripped back to 1862. Surprisingly, Tim takes it rather well…almost too well. Believing he is invincible, Tim enlists in the army when Casey trips back to present time, leav It’s been a year since we last saw Casey and her boyfriend, Nate. Things are just heavenly for the couple and she hasn’t even tripped the whole time. Yep, life is good! Well it is until Casey’s mom finds pot in her brother Tim’s possession. While Casey is trying to question Tim about the pot, the stress comes on and they are tripped back to 1862. Surprisingly, Tim takes it rather well…almost too well. Believing he is invincible, Tim enlists in the army when Casey trips back to present time, leaving him behind. He wants to see firsthand what a real battle looks like. So while Casey is trying to find a way back to the past rescue him, Tim is about to get his wake up call. Will Casey get to him before it’s too late or will Tim be stuck back in the past forever? If ever there was a fictional character that I wanted to slap around a bit and say grow up...it would be Tim. Lord help me if there weren't times I wished I could reach into the stinkin book and knock some sense into him so he would learn a lesson or 2 about the ways of life. Even so, it was fun reading about him. But one of the best characters was Willie. You will see why when you read the book. I don’t want to give that part away. Putting aside the time traveling, I didn't think this second book was remarkable. I found Casey to be stupid, overreacting in terms of Nate's dislike/jealousy of Chase. Further, she chose to ride with Chase over her boyfriend, which made matters inherently worse but apparently, she was the victim. At the end of it all, why was Nate the one to apologize with heaps of flowers when she was the one in the wrong all along? More so, why was Chase introduced in the first place? I thought he would add som Putting aside the time traveling, I didn't think this second book was remarkable. I couldn't wait to read more about our heroine's travels when I started reading. I was, sorely, disappointed in the way this book went. The writing was not as good as it was in the first book and the relationships established in the first book barely grew and need more expansion. The ending was disappointing in the fact that you could easily assume what occurred after. This is not free on Kindle. 3 stars. Recommended for 12-14 year olds. Cassie and Nate are back in this brilliantly crafted, and written sequel. The story resumes with its usual lighthearted humor, and intensity. Except, this time around, there’s family drama, as Tim trips with Cassie into the past. But that’s not all, because Willie (from the past), accidentally trips back to the future with Cassie. Unfortunately, the Civil War is at its’ peak, so Tim’s off to war, unless Cassie can take Willie back in time, while bringing Tim back safely. Hopefully, with the help of her experienced tripping BF Nate, she’ll pull it off. The story is told in alternating POVs of Cassie and Tim. I’m not sure why the Tim’s POV was featured; I’d have much rather preferred Nate’s POV. As a result, I skimmed through much of Tim’s POV and his war experience. On the other hand, I devoured the chapters focusing on Cassie’s POV. I was hoping for more Cassie & Nate bonding, but they only shared fleeting moments of sweetness. I think my biggest issue with this series is that it’s too short! We get 2-3 trips at the most, and then the rest of the story focuses on the present. But, because of all the things that go awry (in both past & present), and issues that need to be resolved, the character/relationship development is hugely weakened. Hence, the story felt more plot driven, rather than character driven, which was slightly disappointing. Also, I’m not ashamed to admit that I’m a supporter of well written love-triangles. So, when Chase stepped into the picture, I was thrilled! But, to my dismay, he was barely in the story... Overall, I wish each interaction between the characters were drawn out a bit more; they felt rushed and too quick for me to really appreciate. However, I really did enjoy this sequel. I’m not sure if I’ll continue, as the next book isn’t about Nate and Cassie; I’m not ready for their story to end yet... But I'm sure I’ll be rereading the first two books in the near future. Casey has an unique ability. She is a time traveler. This book is a sequel an I liked it just as much as the first book. Casey travels back to the 1800's with her brother. She has figured out that her time travel happens in a stressful moment. What is more stressful than a mother finding drugs in her brother's bedroom. Trying to talk to her brother, they both take a trip back in time. Tim is having an emotional/rebellious crisis. He looks at the time travel as a sort of game. The rules of the past Casey has an unique ability. She is a time traveler. This book is a sequel an I liked it just as much as the first book. Tim is having an emotional/rebellious crisis. He looks at the time travel as a sort of game. The rules of the past don't apply to him, or so he thinks. Casey never knows when she will come home. She gets a tingly feeling and knows that she has moments before she is home. Tim didn't heed her call and stayed in the past. She even manages to bring a person from the past into the future! The book has some wonderful historic elements. The time period is of the US Civil War. I'm glad that Elle Strauss didn't sugarcoat the hardship and death rate of the soldiers. This is some romance angst, some action, and historical research. I read this in the Clockwise series omnibus so I won't go into too much detail as I read the whole thing in two sittings. I must say that I really liked the main character Casey and her take on her 'gift'. It took me a while to warm to Nate and even longer to like Tim. The different POVs in this instalment were a bit distracting too. Not as exciting as the first since I knew what would happen, but still good. I'd give it a solid 3.5 stars. I was kind of disappointed with this book. I felt that the first one was so much better on almost all levels. The story felt rushed and characters shallow. I liked the Civil War scenes. I think they remind everyone, especially the young adult reader, how grateful we should all be for the sacrifices of prior Americans. The millennial teenage reaction is a bit glossed over, understated, but adequate for a quick fun read. I liked this second book even better than the first, because when Casey accidentally takes her brother Tim back in time it causes all sorts of problems - for him, for her, and for everyone involved. It is written from two different points of view - both hers and Tim's - which helps explain why the characters act the way they do. This installment was as much fun as the first ~ it's the 2nd in a six book series. This time the adventure begins when Casey accidentally "trips" back to the 1860's when she is touching her brother's arm and she takes him with her. Her brother is nothing but trouble, so this ends up being quite the rescue mission for Casey and her boyfriend, Nate. So fun! Series can be tricky. You start a series and fall in love with the characters, but things start to circle with later books. Well, this one is not like that. Oh, the falling in love with the characters is true. But this second book is even stronger than the first. I can only hope that the trend continues with the rest of them. I just finished this book. I read it in 4 hours. That worked out to $1/hour. I think the price could be better. However, it was a really good book. The characters are good people. The books are clean. DNF you know I just felt like this was a repeat of the first one- which was good, but life is too short to read boring books. Things are getting complicated and difficult decisions have to be made. Enjoyed the continuation of the story. We join Casey a year after Clockwise to find lots of things have changed. Nate & Casey are still together and Casey's trips to the past has become less frequent. he sees it as a great adventure. It becomes all too real when he becomes stuck in the past with the Civil War raging. Casey needs to find a way to get back to Tim and bring him back to their time before he gets himself into trouble. The adventures of Casey Donovan continue in the second book of the series. While Nate, her current boyfriend, may have accepted her "tripping" back to the past, Casey still has a far from stress free life. Her brother Tim is not getting over his temper tantrums which began when their parents had separated. He gets into trouble every chance he gets and Casey gets mad at him for causing trouble where none needs to exist. Naturally this triggers a trip to the past and Tim is shocked and thrilled to The adventures of Casey Donovan continue in the second book of the series. While Nate, her current boyfriend, may have accepted her "tripping" back to the past, Casey still has a far from stress free life. Her brother Tim is not getting over his temper tantrums which began when their parents had separated. He gets into trouble every chance he gets and Casey gets mad at him for causing trouble where none needs to exist. Naturally this triggers a trip to the past and Tim is shocked and thrilled to learn about her double life. Like the first book in this series it was a quick and pleasant read. I wanted this one to blow me away and prove that this is a really good time-traveling series, but I'm still not 100% convinced. I'd put it on the same level as the first book, so a 3,5 star rating. Let's start with the 'bads'. I think it's a bit weird that Casey who was doing the time-traveling thing for years and made a mistake only once, taking a friend with her, is now suddenly making so many mistakes while she knows it can b Like the first book in this series it was a quick and pleasant read. I wanted this one to blow me away and prove that this is a really good time-traveling series, but I'm still not 100% convinced. I'd put it on the same level as the first book, so a 3,5 star rating. Let's start with the 'bads'. I think it's a bit weird that Casey who was doing the time-traveling thing for years and made a mistake only once, taking a friend with her, is now suddenly making so many mistakes while she knows it can be dangerous for the people involved and no one really knows what the consequences are for the future. You'd expect her to have learned something, but instead of better she's getting worse at it. She can't control when she will time-travel although she can find ways to trigger it, but once she needs to time-travel to get her brother out of a difficult situation the time-traveling happens without a problem that was just too much of a coincidence for me. I confess that I do not like love-triangles. I've read about too many of those and I believe that in this story it would have not been necessary at all to add that to the mix too. Clockwise is a brilliant book. Its sequel, Clockwiser, was always going to have a lot to live up to, but the blurb promised a darker, edgier storyline with a refreshing new direction. While it definitely delivers overall, there are some aspects that make it not quite as good as the first, fantastic book. This novel is written in dual narrative, which works very well. Tim is quite different to his sister, and his perspective is a refreshing addition. It’s great t Clockwise is a brilliant book. Its sequel, Clockwiser, was always going to have a lot to live up to, but the blurb promised a darker, edgier storyline with a refreshing new direction. While it definitely delivers overall, there are some aspects that make it not quite as good as the first, fantastic book. This novel is written in dual narrative, which works very well. Tim is quite different to his sister, and his perspective is a refreshing addition. It’s great to have a boyish view of the 19th century, and I enjoyed his idealistic computer-game-influenced view of war. Boy, does he find the real thing quite different! It’s really gripping, though, particularly in those last few chapters where you race through to find out what will happen to him. The one thing that bugs me about this story is the Casey/Nate/Chase triangle. I suppose it was always going to irritate me, because it’s hard to imagine Nate as anything other than perfect after the first novel! I think I would have liked Chase to have been more of a real threat, really. He was just a bit…well, too full of it, too obnoxious. I never wanted him and Casey to go anywhere, which might have made him a more dangerous figure in the story. And the literal ‘removal’ of that plotline felt a little…convenient. Putting that to one side, however, there are a lot of very human moments in the tension between Nate and Casey that I liked a lot. The final resolution between the pair is cute, and I love the line, “I always want to be your first,” hehe. So overall, I think I will give Clockwiser four stars. It’s not as good as the first in the series, but if you love Clockwise, it’s well worth picking up to find out more about Casey, her family and friends! 1. In the 1st novel Casey is brave and competent and as has survived and carved out a decent life in the past for her visits which is pretty amazing considering she did it all when she was so young and taught herself to survive. In this novel she is kind of silly and immature (even though she is a year older). Her behaviour with Chase & Nate is weird and seems to only be thrown in to manufacture conflict. She likes that Chase is flirting with her and goes off with him instead of her boyfriend yet Nate is in the wrong for being upset. Huh? Can you imagine how Casey would react if some girl was throwing herself at Nate & he chose to drive off with her instead of Casey. And deciding not to take Nate back with her looking for Tim made no sense either. He has been back with her multiple times and proven that she can rely on him. They make arrangements to go together and at the last minute she drops his hand. Again huh? 2. Tim is completely unlikeable and his decision to stay in the past so he can join the civil was inexplicable. I really genuinely didn't care if he died (aside from the fact that it wold upset Casey and her parents). That a good portion of the book deals with his story and POV made this book less enjoyable. If you want to show the horrors of the Civil War then at least have him conscripted and having to fight until he and Casey could meet up again. That would have made more sense. 3. Chase added nothing to the story except some weirdly manufactured conflict between Casey & Nate. It would have made a lot more sense to introduce his character if he had something to do with all the time travel stuff. 4. The stupid insta-love between Willie and Lucinda. I was eager to continue reading about Casey's travels, what happens with the Watson family and about the rest of her "normal" life. This book skips ahead quite a bit, and it seems that Casey hasn't "tripped" since the last book left off (which is a long time to go without?). Anyhow, I found this book a bit more frustrating than the previous one mainly because everyone acted true to their character - or more simply: TEENAGERS. Moody, self-centered, and lacking in forethought. This book differs th I was eager to continue reading about Casey's travels, what happens with the Watson family and about the rest of her "normal" life. This book skips ahead quite a bit, and it seems that Casey hasn't "tripped" since the last book left off (which is a long time to go without?). Anyhow, I found this book a bit more frustrating than the previous one mainly because everyone acted true to their character - or more simply: TEENAGERS. Moody, self-centered, and lacking in forethought. This book differs than Clockwise, in that it is told from both Casey's and Tim's POVs. Tim really wasn't a big part of the first book, so getting this large dose of him was trying on my nerves (seriously he was a selfish brat). Lots of character growth though! All the characters, including Lucinda, are put in new situations and are unsure of how to proceed. Casey went from being an awkward nobody to having two guys pursue her. Although I don't think Casey handle the situation particularly well, she did stay true to herself and everything worked out in the end. That sentiment holds true for Nate, Tim, and even Willie (whom I adore). You even get appearances by Samuel (!!!) and Nate's mom, plus some of Casey's friends. Elle is the bestselling author of fun, other-worldy YA: whimsical things like time-travel, fairies and merfolk (with a nice helping of romance!) She divides her time between BC, Canada and Dresden, Germany, and enjoys drinking coffee and eating chocolate in both places. She also writes Dystopian YA, Historical Fiction, and Mystery Suspense as Lee Strauss.